The Foxtail Palm tree is so named because of its bushy fronds resembling a foxs tail. Discovered in 1983 in tropical Australia and a threatened species there, it has gained much horticultural acclaim throughout the world, especially in Florida, Texas and California. Used in vast numbers in landscape designs, it displays its magnificence in ways other palms cannot creating an exotic, tropical appeal. 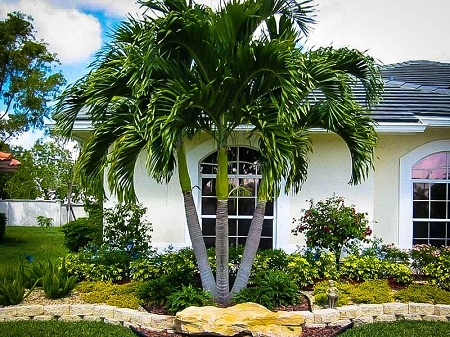 The Foxtail Palm tree is considered relatively fast growing and can reach heights of 25 feet or more in as many years. While young, it can be container grown and begins to display its beautiful trunk and bright green crown-shaft after 4 years. Seeds are large (nearly 1.5 inches in length) and hang in clusters turning bright red when mature. Generally Foxtail Palms can be grown as a single trunk, double or triple. Little care is needed with these palms beyond normal fertilizing and the occasional use of Liquid Copper Fungicide during the most humid, hot months of the year.